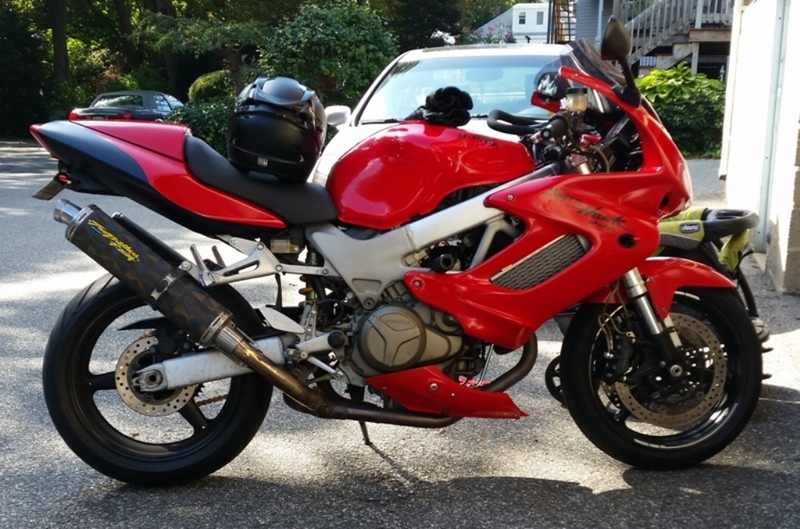 Recently bought a pair of used Akrapovic slip ons for my 99 superhawk. Having a hard time finding a linkage pipe / mid pipe to connect my new slip ons to my stock header pipe manifold. Any ideas? Currently have the Jardine RT - One high mounts installed which include the linkage pipe connecting to the stock manifold. They're extremely old and falling apart. I thought id be able to do a simple switch by reusing the jardine mid pipe but the akros are much longer than the jardines and stick way too far out the rear of the bike. Looking for a set up that keeps my exhaust angled up and not low mounted like I've been seeing. 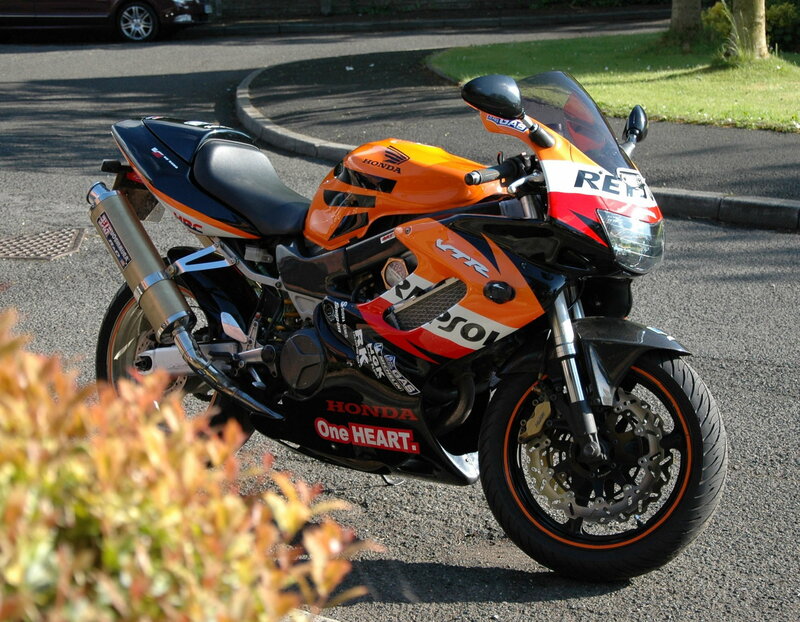 Included two pictures of what im trying to obtain and the setup i currently have (not my bike). So you said you bought "slip ons" but do you just have the pair of mufflers then and nothing else? To get the RC51 "low to high" look you'll need a pair of standard mount aftermarket midpipes with a pair of aftermarket high mount muffler hangers. If your midpipes have a tab (some aftermarket do, some don't, the stock mufflers do) you'll need to cut it off and then the midpipes can be rotated up higher. I have aftermarket hangers that'll raise the mufflers 3" higher than stock. The ones in the top picture might be a little higher than that. You can probably use the Jardine hangers you already have and that'll get the outlets pretty high (but they do look like they'll locate the muffler clamp further back on the muffler). As far as where to get the midpipes? You have to either find a used pair or you may call Delkevic or Danmoto, etc, etc, etc and see who will sell you a pair separately. Most of the stuff that was once available for these bikes is simply no longer available new, and many of the companies who made some this stuff are no longer even in business. I know new polished stainless ones are also available on ebay.co.uk. However off the top of my head I believe your mufflers use two springs and the link below is clamp so you could have spring loops welded on. Two Brothers midpipes use spring loops but again you have to call to see if they still have any (those are the older style so they probably don't). You also may need to have the pipe ends modified/expanded to fit whatever you have as I have no idea where your mufflers came from/what size the inlets are and what they originally fit. 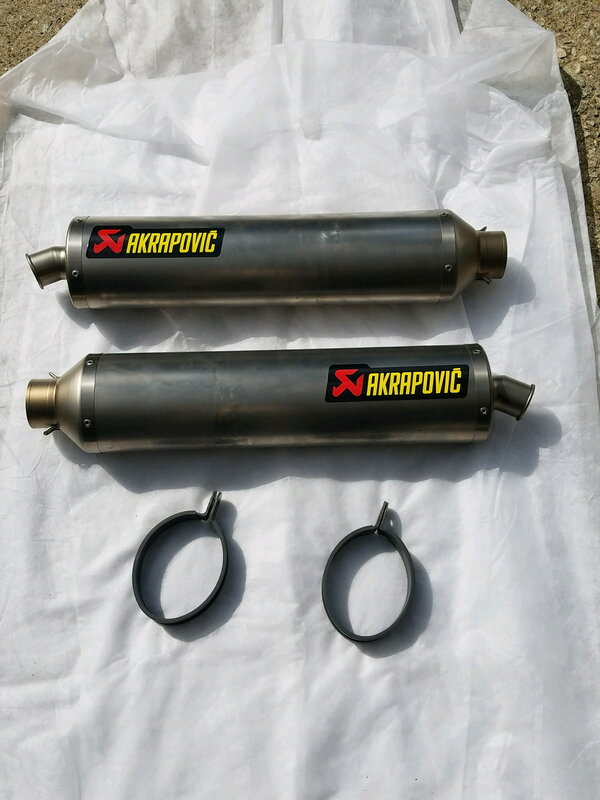 Unlike a brand like Two Brothers, whose mufflers were all the same inlet size Akrapovics do vary in inlet size depending on what bike they were originally designed for. What you want is pretty easy to achieve, but because aftermarket stuff (and new OEM parts as well) is getting much harder (or now impossible) to find in 2017 it's going to require a little homework, a little legwork and a little patience. If you LIKE the S-bend of the Jardines you could simply cut down/shorten your Akrapovics, but you still have no spring loops and again also may have to modify the midpipe outlet size to fit into your mufflers. The look you're going for is easy to achieve with any low/standard mount set of pipes. Again you simply need higher mount hangers and if the midpipes have tabs you cut them off. Your situation is made a little more difficult because it sounds like you only have a pair of mufflers and are going to have to go through the trouble of locating and probably modifying a pair of midpipes to fit them. Akrapovic made full systems and I'm pretty sure also slip ons for the Superhawk, so you may also want to contact them and see if they have them. 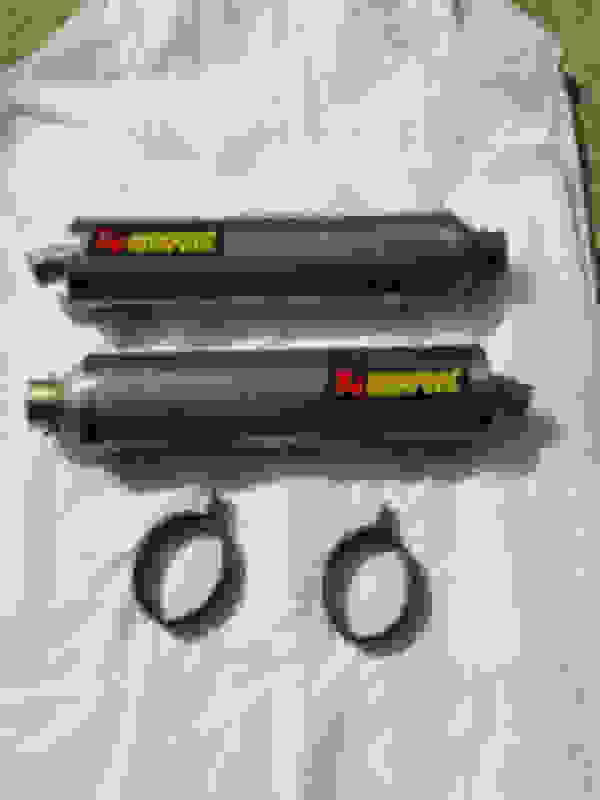 Once again, your mufflers could be off anything with dual mufflers so if you get Superhawk specific replacements they may not fit your unknown mufflers. Last edited by captainchaos; 11-15-2017 at 03:55 PM. Thank you for the feedback! Your link to the mid pipes looks to be exactly what im looking for. 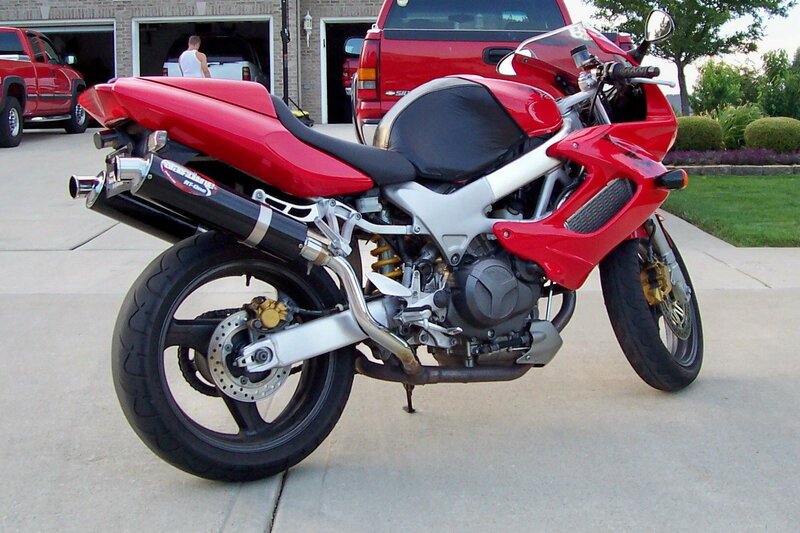 All I purchased were the akrapovic slip ons including the mounting brackets and two size converting inserts. The 2 inserts convert the akras 2.5" diameter down to a 2" diameter. They were originally mounted on an RC-51 of which the owner bought a newer different set and sold me these. Ill include a picture of them below. The second picture of the red hawk is the exact set up that i currently have. The high mounts, s pipe, etc. The Jardine setup is all clamped together. Couldn't i clamp down the akras to the new mid pipe? Have no experience with the spring locking system. Completely agree with the rarity of parts for this bike. Only seeing a pair of yoshimuras sold today with the perfect fitment to the stock exhaust manifold. Spending money on the mid pipes you posted is risky seeing theres no guarantee they will fit but not seeing any other options. Ah i seen now that you couldn't clamp down the akras because they dont have any spaced cut outs needed to clamp down on the mid pipe. I wouldn't. I mean you could cut slots in them but clamping these down is ghetto and they're too nice (and too expensive) to do that with. You have to measure the inner diameter (I.D.) of the muffler inlets you have and purchase a midpipe that has the same or a very close outer diameter (O.D.) outlet where it would slip into the muffler. A cheap pair of calipers from Harbor Freight will come in handy many times over for this sort of thing. That way if you want to purchase midpipes you can simply ask and you know what size you're getting. If the size of the midpipe outlet is say a LITTLE too small an exhaust shop can expand the pipe slightly so it's a nice fit. You can also purchase the spring loops (you have to search around they're out there) and have a decent welder attach them. Then you can secure them properly with springs. It also looks nice and it's done properly. I wouldn't booger these up they're too nice. If it's too much trouble I'd just sell the mufflers here or on a place like Ebay and purchase a matching set of slip ons. Then all you need are the higher hangers and possibly the need to cut off the tabs on the midpipes if whatever you have comes with them. The only Superhawk exhaust I've ever seen that came with that look was a full Yoshimura race system. Any other high mounts have the sort of "S" bend you see with the Jardines (some being a little higher than others). But again it's easy to get that look with standard/low mount slip ons the way I already described. As of over two years ago I contacted Akrapovic about link pipes for a SH and the answer was only one side was available. They never made high mounts for the SH. Akrapovic systems use springs to hold everything together, not clamps. You could cut slots and clamp the cans on. Unfortunately, with the RC51 exhaust you will have to either weld yourself the mid pipes or get someone to weld for you. Other options you can do with lower mount for the superhawk by twisting up as I did, all you have to do is couple of brackets for the rear foot pegs and twist the exhaust in and up. As evil man of nothing said, it would be sacrilege to butcher perfectly good Akro cans. The Ti sleeves alone, new are $168 ea.